We have recently completed a comprehensive renovation! 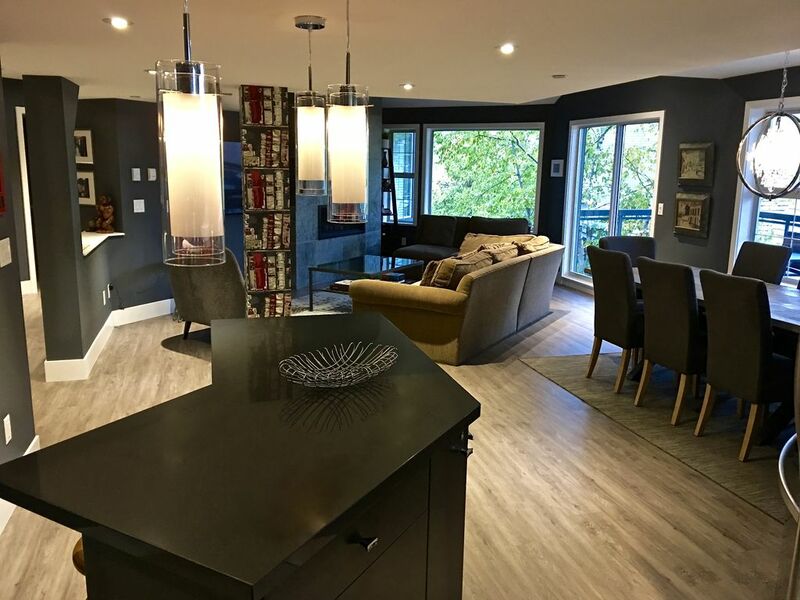 Our townhouse is one of the largest and best appointed two-story townhomes in Whistler with over 2000 square feet of living space and spectacular mountain views! We've got it all, and every inch of our home has been completely remodeled as of Summer 2016! New flooring throughout, new kitchen and bathrooms, new fireplaces, new furniture, new memory foam mattresses, new linens, new sheets and towels, etc., etc.! We've thought of everything, including USB charging outlets throughout for your laptops, tablets and smartphones! The downstairs has an open floor plan. The living room has high vaulted cathedral ceilings, a spectacular all-slate gas fireplace and a new 65' LCD flat screen tv. Wireless 150mbps high speed internet completes the package. Off the living room is a large covered deck with a hot tub that comfortably seats 4 to 6 adults. There is seating for eight at the dining room table. The brand new kitchen is fully equipped with stainless steel appliances and has a central island with bar stools for additional eating space. Upstairs are two master bedrooms. Both are en-suite with their own private attached [all new] bathrooms, individual private balconies, and queen-size beds. One of the master suites also contains a dramatic new fireplace, a new 50' HDTV with full cable service, and a brand new bathroom with heated floors and a tub. There are two additional bedrooms on the lower level. Each has two single beds and share a third full bathroom. All bathrooms have new state of the art shower stations and heated floors. The townhouse is on the second floor (stairs only) with parking for two vehicles. It is our private family vacation home and it's loaded with many personal effects which we are happy to share with our guests. This unique home is located at the Lynx in the prestigious Blueberry Hill area of Whistler, British Columbia. The complex is located in Whistler Central, just a little over half a kilometer (approximately 1/3 of a mile) from the Village and ski lifts. A protected pedestrian path winds it's way along the Whistler Golf Course and delivers you directly into the Village. The Whistler Shuttle stop is also just a few steps outside the entrance to our complex. There are few properties that can boast all that we have to offer at such an affordable price and central location! We would love you to stay in our family vacation home and create your own cherished Whistler memories year after year! We offer special discounts to all of our returning guests! Proud mother of two extraordinary human beings, business woman, world traveler, cruise enthusiast, theater aficionado, tennis buff, political junkie, and lover of all things Whistler! A lifetime vegetarian with a passion for foreign films, I am a rare native of Miami, currently residing in Boca Raton, Florida. I searched for years for the perfect mountain hideaway to escape the untenable South Florida summers. I visited virtually every ski resort in North America before discovering Whistler. I fell in love with Whistler Village and the unparalleled beauty of British Columbia. The summers are truly glorious and we spend them enjoying the beautiful outdoors and hiking through the majestic wilderness. Location, location, location! Our complex is perched above the Whistler Golf Course in Whistler Central. You can see the ski runs on Whistler Mountain! There is a beautiful wooded path adjacent to the golf course. During nice weather the center of the Village is a short 15 minute walk. We have 3 full baths with showers. There is one tub in the upstairs master. Great views of Whistler and Blackcomb Mountains. We will provide you with the phone number to the townhouse prior to your arrival. The line is available for all local and long distance calling throughout Canada and the US! Thermostats are located in every room. All linens are fresh and washed in advance of your stay. Our cleaning service will wash them after you check out. You needn't strip any of the beds or lift a finger. State of the art front loading machines. We do not supply laundry detergent. State of the art front loading machines. One covered space and one additional uncovered spot. Additional guest parking is available but not guaranteed. Experience 150mbps of download speed! We provide 2 towels per guest. We also have separate hot tub towels in the left cabinet of the lower level bathroom. We've added a complementary Wifi network. Instructions will be provided upon arrival. Spacious open floor plan. Our living area has a 65" flat screen, a gas fireplace and cathedral ceilings. Stainless steel with bottom freezer! Condiments and spices and whatnot. Please help yourselves. Our large dining table is made of reclaimed wood and seats 8. 2 flat screens. Our living room tv is 65". There's a stack of old DVD's in the closet of the 1st lower level bedroom. The lower level balcony has the hot tub and an outdoor dining table. There are two additional smaller balconies off each of the upper level master suites. C'mon, it's Whistler! We're the #1ski resort in the world! Stairs only. There are no ramps or elevators. Outside on the balcony. Champagne not included. The host was very helpful prior and during my stay in Whistler. He gave me suggestions on places to visit, eat, and shop. There were easy to follow instructions in the welcome email. The condo was beautiful, clean, and a quick walk to the town's center. I recommend this home to anyone visiting Whistler! The condo was spacious, clean, comfortable, well furnished, and in a great location. One of my best stays in Whistler yet! This location was perfect for our group celebrating son’s graduation from Ole Miss with an Early Snow ski trip. Immaculate. Private. Peaceful and relaxing. Excellent location to be just removed from the bustling village . Description was detailed and accurate. Having a car in winter made travel easier with skis, but could walk the mile to the village or catch the bus if desired. Hope to return one summer to this delightful area. Great location, clean and perfect size for multiple guests. The place was exactly like shown in photos. Clean, spacious, close to village and perfect for a girls getaway. Thanks Eric! This was a perfect getaway for our group of friends. Plenty of space, great location to the village, and secluded enough to be extremely relaxing! This condo had everything we could possibly need for a great skiing holiday and family reunion. Eric the manager was responsive to a couple of minor issues and everything was well organized. We would very happily stay there again. Whistler Village is a a vibrant pedestrian-only hub located directly at the base of Whistler and Blackcomb Mountains. With countless shops, restaurants, and accommodations, the Village maintains a year-round mountain culture and has everything to meet your needs! A full refund less a 4% transaction fee will be provided if canceling prior to 30 days of arrival.